It took three times for her to take the crown but she finally did it! 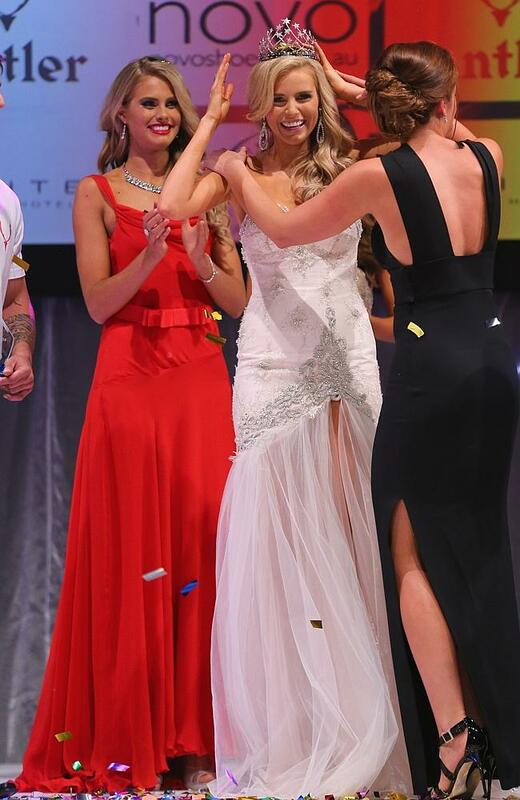 Tegan Martin from Newcastle won the Miss Universe Australia 2014 pageant held in the city of Melbourne on Friday night beating other thirty women vying for the crown. Martin who is twenty-one years old currently studies nutritional medicine with the goal to use her studies to shed light on youth mental illnesses and works also as a model, appearing on the TV reality show Australia's Next Top Model in 2011. "It has been a massive journey for me, so this is overwhelming, I'm shaking", she said right after her crowning. Tegan comes from the same home town as Jennifer Hawkins, Miss Universe 2004! As said before, the new Miss Universe Australia had previously taken part in the national pageant. She had impressively been the first runner-up in 2011 and 2013 editions, meaning she had that pageant material and was ready to take on the role of the Aussie's queen. When asked about this minutes after being crowned, she said: "I came second twice. I thought it wasn't my destiny, I can't quite believe it". The pageant had 31 beautiful contestants but only 10 were the lucky to be on the Top 10 formed by Natalie Roser, Danielle Johnson, Monika Radulovic, Briden Starr, Anna McEvoy, Madeleine Cowe, Melinda Kemp, Alex Hecker, Kiani Lee Trisna and Tegan Martin. Then the group was cut down to a Top 5 with Natalie Roser - who ended up as first runner-up-, followed by Danielle Johnson (second runner-up), Monika Radulovic and Briden Starr that wrapped up the group in which Tegan Martin standed out the most and took home the title of Miss Universe Australia 2014, granting her with the opportunity of representing Australia in the Miss Universe 2014.